But why supplement iron in wheat in the first place (for instance)? My understanding is that it was to combat anemia… Isn’t pernicious anemia one of the typical symptoms of celiac? Paul, can you expand on this statement at all? ” is why I’m skeptical of the health merits of fermented cod liver oil.” I have started taking it, I do keep it refrigerated to try to minimize degradation but will that be enough? As far as I can tell, the rationale of the fortifiers was to make white flour have the same iron content as whole wheat, even if the whole wheat iron is locked away in phytate. 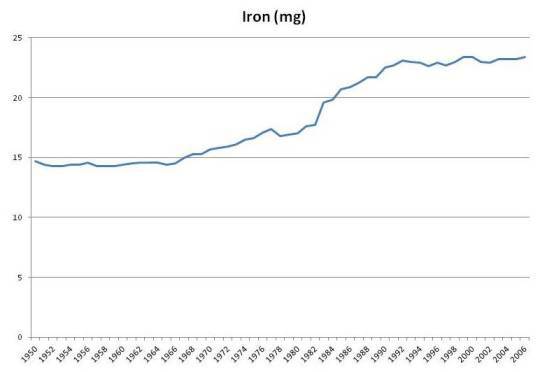 Interesting thought about cutting wheat reducing the need for iron. Well, the fermentation process itself exposes the cod liver oil to bacterial enzymes and compounds that can potentially lead to degradation of food components. After all, the bacteria have to degrade the cod liver oil to feed on it. In generally I think fermented animal foods are much riskier than fermented plant foods. The one exception is dairy which contains sugars specifically designed by evolution to feed probiotic flora. I don’t have any data on this, it’s just a suspicion. But I have heard a few anecdotal reports of people having trouble on fermented cod liver oil. 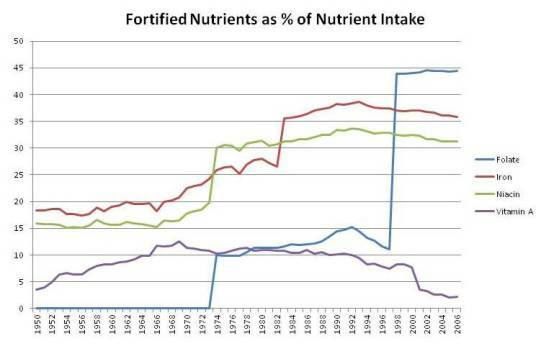 I look forward to your series on fortification and supplementation, and especially your new recommendations. I was in the midst of evaluating multivitamins, and will put getting a new one on hold. I have been itchy about enriched foods for awhile now. I am particularly leery of iron. What do you think of the iron gout relationship? I know that there have been some studies showing that people who go from traditional diets high in fruit to western style diet full of flours and drinkable fructose have been shown to have lots of problems with gout. Do you think that fortification may play a role in these western conditions? I’m getting tempted to give up multivitamins entirely and just do individual supplements, or perhaps a multimineral plus individual supplements. I’ve never found a multi I could fully believe in. Also, our food keeps getting more nutrient rich, and I’m thinking we can reduce the frequency of supplementation, maybe to once a week for most nutrients. I haven’t looked into gout, it’s a great question. I’ll keep it in mind and look for papers. Regarding your concerns over niacin, could you provide some citations? Do you have the same concerns with niacinamide? Thanks. I’ll have a little to say about niacin later. Yes, I have the same concerns with niacinamide. Niacinamide is at least free of the liver toxicity that niacin has, but that matters at higher doses. If one is following a PHD then they are not getting any of the enrichment/fortification because with the exception of rice followers are not ingesting high levels of the vitamins you have discussed. My understanding of the growth in multi supplementation has been in large part a response to fruits and veggies being bought at the grocer, sitting on the shelf and not containing the amount of vitamins as freshly picked from the garden/tree would have. I think you are correct about going in the direction of mineral supplementation with select vitamin supplementation. Be interested in your fully developed thoughts on that. I think D,K, a B complex with no more than 400mcg of folic acid might make sense. I’m not sure how much of the “B’s” you can from PHD if you eat no grain except rice, and if you eat limited rice, but mostly potatoes is that sufficient for your “B” needs? Also, if someone takes a multi, what do you think the maximum amount of A should be along with beta-carotene levels? I think we’re going to track our food for a week and see how much we’re getting of various nutrients. I haven’t really figured out what the new advice will be yet. There might be a few adjustments to our plateau ranges, and then we’ll measure what a PHD-according-to-the-food-plate diet provides, and think about the best way to get everything in range. Re folate, I don’t think you need a lot of folate to prevent neural tube defects. Any real-foods Paleo-type diet (as opposed to a soda and bread diet) should do it. As therapeutic use of niacin involves amounts of 1,000mg/day or more long-term, I don’t believe that 32mg/day would/could be harmful. @Nigel, the RDA fwiw is half that. That’s part of what makes it interesting. Genes don’t reach 40% of a population unless they have benefits as well as costs, and supplementation didn’t start recently so I don’t think the benefit of the gene is to compensate for supplemental folic acid. So I’m skeptical that that gene variant is unhealthy on a healthy diet. I’ll be discussing this, but I think the miscarriages result from low choline intake rather than low folate. I found a multi,”Oxylent” that seems relatively harmless,and has a nice mineral profile.Perhaps that would be a good basis with a few individual supplements.I have emailed them with a few questions and they are very open to continued discussion…might be worth a look. Hi Paul – I don’t think my comment on active folate came across completely. When a person takes in folate it has to be activated by methylation so that cells can use the folate further in their metabolic processess. 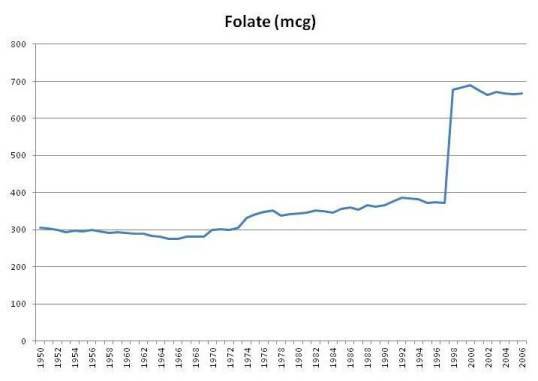 People with mutations on the MTHFR gene are slow at activating folate – I think I read that the dietary non-activated folate can build up in the persons system and I’m curious if this is what contributes to the increased cancer. Other things that are related to this MTHFR defect are poor detoxification, especially of heavy metals, and poor immune function. This in turn often contributes to gut biofilms that are populated with pathogenic yeasts, bacteria and parasites. 98% of people diagnosed with Autism have at least one of the common defects on this gene. People with Aspergers tend to have it…its a long list of ‘traits’ that is related to the MTHFR gene defect and you write about a lot of them (including autism and the biofilm problems). Thought you’d be interested. There’s a ton of papers published its a pretty hot topic right now. Yes, you are making a great point. Folic acid/folate needs to be methylated, so you need methyl donors, eg choline. If people have a low choline:folate ratio they will get into trouble. This is great background for what I’ll be writing about soon. Thanks for the tips. So just to get things straight, you are suspicious of fermenting cod liver oil because it could lead to the degradation of vitamin A, I get that, so what about molecular distillation? And what if it is a combined with enough vitamin E to prevent oxidation? I know that cod liver oil would be better than isolated Vitamin A, but could it still pose a problem? I would only be consuming the RDA of Vitamin A from it. Something I’ve been wondering about for a while now is having surety on exactly what is getting absorbed from the gi and intestinal tract on a per person basis, i.e. one guy due to gut problems/degradation absorbs only 1/2 of a particular nutrient compared to the next guy for the ingestion of the same quantity. Also, food interactions and competition limiting global intake zinc/copper as an example and throwing of recommendations for intake. I’d be willing to consume fresh cod liver oil as an alternative source of vitamin A and omega-3 fats. It’s a good question. It would be nice if we had good measurement methods for mineral/nutrient status and could monitor them. I know you can get hair mineral analysis and the like, but I have no experience with it. It is hard to recommend specific micronutrient intakes for the reasons you mention, different people will find different amounts optimal. BMC Public Health. 2010 Dec 2;10:746. B-vitamin consumption and the prevalence of diabetes and obesity among the US adults: population based ecological study. Zhou SS, Li D, Zhou YM, Sun WP, Liu QG. The prevalences of diabetes and adult obesity were highly correlated with per capita consumption of niacin, thiamin and riboflavin with a 26-and 10-year lag, respectively (R2 = 0.952, 0.917 and 0.83 for diabetes, respectively, and R2 = 0.964, 0.975 and 0.935 for obesity, respectively). The diabetes prevalence increased with the obesity prevalence with a 16-year lag (R2 = 0.975). The relationships between the diabetes or obesity prevalence and per capita niacin consumption were similar both in different age groups and in male and female populations. The prevalence of adult obesity and diabetes was highly correlated with the grain contribution to niacin (R2 = 0.925 and 0.901, respectively), with a 10-and 26-year lag, respectively. The prevalence of obesity in US adults during 1971-2004 increased in parallel with the increase in carbohydrate consumption with a 10-year lag. The per capita energy and protein consumptions positively correlated with the obesity prevalence with a one-year lag. Moreover, there was an 11-year lag relationship between per capita energy and protein consumption and the consumption of niacin, thiamin and riboflavin (R2 = 0.932, 0.923 and 0.849 for energy, respectively, and R2 = 0.922, 0.878 and 0.787 for protein, respectively). Yes, that’s one I intend to discuss. It won’t convince Nigel but it is entertaining. interestingly this effect appears to be of transient nature, cf. Diabetes Care. 2012 Apr;35(4):857-860. Epub 2012 Feb 14. Effect of Extended-Release Niacin on New-Onset Diabetes Among Hyperlipidemic Patients Treated With Ezetimibe/Simvastatin in a Randomized Controlled Trial. Guyton JR, Fazio S, Adewale AJ, Jensen E, Tomassini JE, Shah A, Tershakovec AM. Corresponding author: John R. Guyton, guyto001@mc.duke.edu. OBJECTIVE To determine the effect of niacin on fasting glucose (FG) and new-onset diabetes in statin/ezetimibe-treated patients. RESEARCH DESIGN AND METHODS This was a prespecified secondary analysis among 942 hyperlipidemic patients randomized to ezetimibe/simvastatin (E/S; 10/20 mg) or E/S + extended-release niacin (N; titrated to 2 g) over 64 weeks. RESULTS FG levels peaked by 8-12 weeks, then declined even without antidiabetic medication. At 64 weeks, 3.5% taking E/S+N versus 2.6% taking E/S met criteria for new-onset diabetes (P = 0.66). An additional 1.4% taking E/S+N versus 0.4% taking E/S transiently met criteria for diabetes and then remitted (P = 0.46). Of 28 new-diabetes diagnoses in the E/S+N group, 25 occurred by 24 weeks. Among patients with baseline diabetes, 13.9% taking E/S+N and 11.6% taking E/S underwent antidiabetic treatment modification. CONCLUSIONS Increased FG and new-onset diabetes with E/S+N occurred mainly around the time of initial uptitration of N and often improved or remitted without specific treatment. Thanks, Dr Andro. 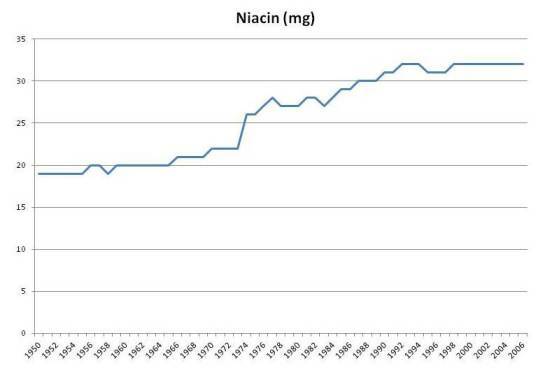 I’ve seen niacin induction of insulin resistance in various places but haven’t looked into it its significance yet. Previously, in talking about how to raise HDL, I’ve recommended using coconut oil induced ketosis rather than niacin – niacin raises HDL by acting on a ketone receptor, and ketones are a much safer way to go. I have definitely noticed that when I add rice to water, the water becomes a murky white. However, I now purchase only unfortified rice and the when I add the rice to water a white powder still comes off. This leads me to believe that I’m just removing starch. I do think washing fortified rice removes some of the enrichment coating, but I don’t think the murkiness alone denotes anything about that. Yay, I loves me cod liver oil. And vitamin E.
Interestingly when looking at all of the data from the study he cites there appears to be evidence of a synergy between vitamin c and e, which seems pretty obvious. When vitamin c and e are combined instance of stroke goes down quite a bit, when vitamin e and c have little impact by themselves. Also I wonder if taking alpha-tocopherol even in its natural form could be detrimental because it’s not the form we’re used to getting. I’m just sharing my thoughts because of the new review. And because PHD recommends vitamin c and selenium supplementation in some cases, which seems to be justified by some studies but not others. Of course that doesn’t mean that we should just consider it ambiguous and therefore all of them are useless all of the time so there, like some people are doing. Maybe it’s time for a sister series to this one to explore the supplement issue? heh the life of a blogger, I know how it is, though. I don’t actually expect a series on this stuff in the near future, it’s just a possibility. Although there is no shortage of topics to write about. The Science Daily story you link is about plant antioxidants (resveratrol, genistein) in vitro. So far as I know, it doesn’t show anything negative about human antioxidants (eg zinc, copper, vitamin C). I think you’re referring to the recent Cochrane Review (http://www.ncbi.nlm.nih.gov/pubmed/22419320). I haven’t read it yet, but the abstract mentions only vitamins A and E as showing significant harm. Those are compounds where the supplemental forms may be quite different than the natural food forms. Selenium is tricky because it’s so dangerous if you get too much, and food amounts are highly variable. I am planning to survey the supplement issue fairly thoroughly, but not sure how soon it will get up on the blog. As you write more about micronutrient supplements, Paul, it would be great if you could talk a little about the many additives in supplements (e.g. stearic acid, stearates, and the like, calcium phosphate, silicon dioxide, coatings and glazes…), and identify the ones you consider potentially problematic. I am concerned that we may let down our guard too much when we take supplements, ingesting industrial gunk that we would never tolerate in food. Heh, yes I meant that review. Could have sworn that link was going to be the one! Sounds great, I look forward to it. Stephen’s question on active folate is a good one. My 10 yo daughter is being treated for a lyme/bartonella infection and her LLMD is supplementing her with the B6 metabolite P-5-P, L-methylFolate and methylB12 to address the MTHFR defect that is so prominent in a lot of kids with lyme induced autism and immune disregulation. We haven’t run the test yet, but this is intriguing to me. My daughter is responding well to treatment; her speech, executive function, handwriting, sound/light sensitivities have improved greatly with antibiotics and supplementation, and the ~80% implementation of your diet. I have been questioning our multivitamin supplementation lately as it lacks the methylated forms, even though we try to eat lots of egg yolks. I am looking forward to you addressing this question. Thank you so much for your hard work, you are helping so many. Thank you, Louise, I’m glad your daughter is doing well. Article seems related to the risky iron fortification of food experiment. Insulin Resistance and Adiposity in Relation to Serum ?-Carotene Levels. Canas JA, Damaso L, Altomare A, Killen K, Hossain J, Balagopal PB. Division of Pediatric Endocrinology and Metabolism, Alfred I. DuPont Hospital for Children, Wilmington, DE; and Nemours Children’s Clinic, Jacksonville, FL. To determine the effects of placebo vs an encapsulated supplement of fruit and vegetable juice concentrate (FVJC) on serum ?-carotene levels, insulin resistance, adiposity, and subclinical inflammation in boys. Thirty age-matched prepubertal boys (9 lean and 21 overweight (OW); age range, 6-10 years) were studied. All participants received nutrition counseling and were randomized to receive FVJC or placebo capsules for 6 months. Total cholesterol, triglycerides, lipid corrected ?-carotene, serum retinol, glucose, insulin, retinol binding protein-4, leptin, adiponectin, leptin-to-adiponectin ratio, high-sensitivity C-reactive protein, and interleukin-6 were measured before and after the 6-month intervention. Homeostasis model assessment-insulin resistance (HOMA-IR), acute insulin response to intravenous glucose, along with abdominal fat mass (dual-energy x-ray absorptiometry) were also determined. Baseline ?-carotene concentrations correlated inversely with HOMA-IR, leptin-to-adiponectin ratio, and abdominal fat mass (P?.01). FVJC intake increased ?-carotene concentrations (P?.001) but did not influence retinol or retinol binding protein-4. Retinol insufficiency <1.047 ?M was present in 18% of the entire cohort at baseline and in 37% at 6 months. HOMA-IR decreased after supplementation in the OW cohort, when adjusted for percent weight change (P=.014). The percent change in abdominal fat mass increased in the placebo group and decreased in the FVJC group (P=.029). A 6-month supplementation with FVJC in the presence of nutritional counseling was associated with an increase in serum ?-carotene concentrations and a reduction in adiposity in conjunction with an improvement in insulin resistance in OW boys. Copyright Â© 2012 Mosby, Inc. All rights reserved. 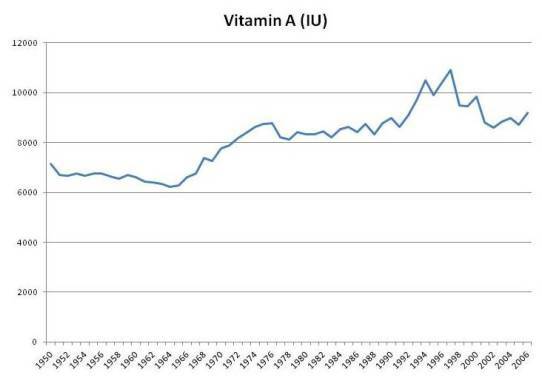 Now, while we have a decrease in adiposity, here, it is somewhat unsettling that supplemental beta carotene increased the incidence of “real” vitamin A deficiency. One distinctive piece of advice you give is to supplement copper. Are you familiar with the survey articles of Brewer on the potential toxicity of copper (and iron)? I was rooting around pubmed earlier and I found this study on vitamin c (still on the subject of antioxidants) http://www.ncbi.nlm.nih.gov/pubmed/10527771 It looks like 1g isn’t sufficient to prevent some of the negative effects from smoking (don’t worry I’m not planning on doing a “mitigating the deleterious effects of chain-smoking” series…, heh) but 2g has some efficacy, suggesting some sort of saturation point where levels are too high to be cleared. Of course this all begs the question of whether or not it’s healthy to do that, especially long-term, this is only an cute study, but the point may be that if people wish to reap the benefits of vitamin c supplementation maybe the best effects come after a certain dosage. I’m not sure if anyone has ever consumed a natural diet with that much, but maybe there’s a difference between natural and supplemental. Just some thoughts. In that study that you cited in the book where vitamin c extended lifespan by 7 years what dose did they take? And what might the deal be when that one was positive but others are negative? Besides the possibility of poor supplement quality and degradation of the vitamin c.
@Louise: its nice to hear from another MTHFR patient on this site. I am ‘clinically measured’ to be on the Aspserger’s spectrum and a holistic doc in WA attributed it to me being compound heterozygous in C677T and A1298C (he said I had it ‘bad’ regarding my rate in activating b-vitamins in the glutathione production pathway). After suffering from gut disorders and social behavior problrms all my life the doc treated me with a biofilm protocol that is similar to a gut cleansing program that Paul has written about on this site. It included enzynattokinase as nattokinase, meetal chelators and antimicrobials. I saw slime, fungus balls, and worms leaving my body over the course of a month. the bad biofilm was gone. Next the doc started me on active forms of dilate and b-12…along with methyl donors like betaine and Dmg and choline. Also supplement with support nutrients on the glutathione pathway including p5p, sam-e, and nac. The docs argument is that I can take all the methyl donors in the world but if my genes are rate deficient in taking the methyl groups and activating my dietary folate and b12 then Ill have issues. hence the fact that we ‘short circuit’s the glutathione methylation issue by taking active folate and methyllb12 because its more appropriate for my individual biochemistry. Let me tell you-all my social awkwardness and gut problems have disappeared. after 20 years with this supplementation regimen. 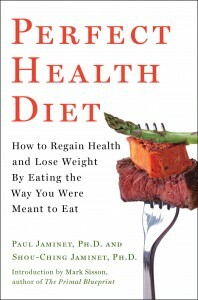 I really hope Paul will look into the MTHFR gene defects and rectify it against his diet better. but do have reservations on your views, as I understand your blog, on the pragmatic risk reward of moderate fish oil use in those that otherwise would manifest severe Omega 3:6 cellular membrane imbalances. I agree whole food is the optimum option, however in our modern world, on a pragmatic risk benefit analysis I believe fish oil has health benefits for most on western diets. Most on western diets do not restrict their Omega 6 LA intake to maybe 2% of calories (pregnant women and those with serious infections illnesses may need more)but ingest maybe 8-10% of calories as Omega 6 LA. Most people have an Omega 6 intake that far exceeds their Omega 3 intake, which is reflected in the Omega 3:6 composition of their cell membranes. Fats in the cell membranes are released in response to stress, immune function, tissue repair, reproduction etc and oxidized often by enzymes to bioactive products. 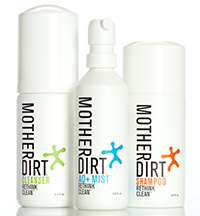 These bioactive products have a range of roles. In very general terms the Omega 6s are connected with inflammation, and Omega 3s often moderate inflammation. Excess inflammation is one of the root causes on western disease. Taking fish oil helps address this imbalance, and so helps reduce inflammatory pressures. Stored Omega 6 in fat tissue has increased from maybe 4% in the 1950s to maybe 10% plus and up to 25% in some modern populations. It takes several years to re-balance the profile of body fats, and during this time those with high Omega 6 stores will be releasing Omega 6 fats and so have a higher ratio of Omega 6 to 3, even if they have meantime significantly reduced their Omega 6 intake. In people with massive Omega 3:6 imbalances I an open to the idea there maybe an argument to a short term kickstart in the form of a modestly higher intake of fish oil / oil fish and some plant based Omega 3 in the form of flax oil. Not everybody eats fish, or has access to high quality natural oily fish, due to cost, availability etc. and then there are the wider issues as to global fish stocks, and pollution with heavy metals etc. Most quality refined oils are free of such pollutants, but of course also lack the other important synergistic beneficial nutrients in fish. Fermented fish oil was being used with health benefits long before the recent sharp rise in the prevalence of western inflammatory conditions. I accept as you propose the ideal is eat adequate fish proportionate to your Omega 6 intake, moderate your Omega 6 intake, and in those circumstances, assuming no historic imbalances,or genetic predispositions, fish oil may indeed be no benefit and indeed could increase the risks of oxidative stress. However as usual things are more complex, and some groups are genetically up to 40% less efficient in converting the plant based Omega 3s to the longer chain fats and particularly EPA and DHA, and so are more reliant on them. There is growing evidence that ‘Celts’ / shoreline peoples may be at higher but by no means exclusive risks of poor conversion, from which one could construct an argument that those people optimally need more long chain Omega 3 than the average. I am not suggesting that the use of any refined food is without risks. However I suggest for those with historic Omega 6 imbalances, including significant amounts in stored fats, who do not for whatever reason have access to or wish to eat fish,(pollution risks – cost – availability) that moderate supplementation with fish oil (providing 1-2 grams EPA and DHA – not mega amounts) will help address the Omega 3:6 imbalance in the cell membranes, and so help address a basket of inflammatory issues. Yes there may well be issues with fish oil when compared to the ingestion of Omega 3s from quality unpolluted fish, but I believe they are far outweighed by the benefits of fish oil consumption in those who would otherwise have severe Omega 3:6 imbalances. I also believe that on the balance of probabilities addressing the Omega 3:6 imbalance for a vast array of reasons reduces the risk of inflammatory related ‘western’ conditions which includes a rising risk of many cancers. The Omega 3:6 imbalance is best addressed through whole foods, but pragmatically on a risk benefit basis in our complex resource pressured often increasingly polluted world I suggest for those who do not chose to reduce their Omega 6 intake, and or have access to fish / choose not to eat, fish oils have a place in improving health. Thanks for your kind post, and your thoughts on the fish oil supplements. I’d like to see the fermented cod liver oil studied a bit in the literature before I would feel comfortable endorsing it. Do you never recommend Iron even for menstruating women? I take 25mg 3X a week. Perhaps, I should stop? Thanks! Thanks for those links. Great reading material! I have my homework cut out for me. Yes, I do recommend iron for menstruating and pregnant women. The level you’re taking is great. I’m a little confused: Your diet plan says not to eat wheat, but is whole wheat unhealthy? My family eats whole wheat that we grind in our VitaMix from wheat berries. Is this not good for one’s body? You may have adressed this before, but this is my first time seeing your website. Yes, whole wheat may be worse than refined wheat, because the bran has about 50% more toxic proteins per unit weight than the kernel. I haven’t used a multi in over 10 yrs; different times of day for different supps (calcium in afternoon, magnesium at night, etc. ), and even different amounts on different days. Whenever vit E occurs in food, it’s always all 4 tocopherols, leading me to conclude that they are the essential components (not different “forms”) of vit E. My E supp is liquid mixed tocopherols in a gelcap. > You need at least as much calcium as magnesium, but not more than twice as much. If 400 mg mag, then 400 – 800 mg cal; if 1000 mg cal (the RDA), then 500 – 1000 mg mag (I do NOT recommend one g mag!). > You need at least as much omega-6 as omega-3, but not more than twice as much. If 1000 mg o-3, 1000 – 2000 mg o-6; if 2000 mg o-3, 2000 – 4000 mg o-6. > You need at least as much vitamin A as vitamin D, but not more than twice as much. If 5000 IU vit A (the RDA), then 2500 – 5000 iu vit D; if 5000 iu D, then 5000 – 10,000 iu A. @Shannon & Paul: I don’t know if anyone of you has ever thought about that (or Paul written about it), but did it ever occur to you that there is no whole grain in whole grain foods? What I am hinting at here is that eating REAL whole grains and not products that are made of flour that was made from whole grains and 100x processed, would be “soaked” and “fermented” in your digestive tract before they were taken up; or they would pass through totally undigested. The processing process on the other hand, creates all sorts of micromolecules that would NOT occur when you chew the “whole grains” or when they are broken down enzymatically or “eaten” by bacteria. @Jeffrey: You should no underestimate the amount of calcium you get from hard water (I calculated my intake from water to be ~600mg+, alone!) and greens – supplemental calcium is usually simply unnecessary. On the other hand, MG is currently among the most overhyped supps. It is as you see not a good idea to take more than 400mg – especially if you are on a paleo diet which often is pretty low in salt / hypotension and brain fog are usually the consequence of this practice. Great points. We’re eating bone broth a lot these days, that should supply plenty of calcium. Dr Andro, I hadn’t considered that, but it seems quite likely. The grains evolved to evade digestion, and are small and numerous and hard for that purpose. The greater the integrity of the grain, the more likely they are to survive digestion intact.